You’ve heard it a thousand times in real-estate but it is much more important in fishing. The Clark Fork Outpost (CFO) is on the Clark Fork River in its most exclusive stretch, just a few miles downstream from the confluence of the St. Regis and Clark Fork rivers. Across from the Outpost there are no roads, trains or highways … just eight beautiful river miles of forest. I’ve been fishing the waters of Montana my entire life so when I pick a place to put a lodge there is a reason. The CFO is surrounded by over a hundred miles of the lower Clark Fork. We can put in and take out at the CFO which reduces windshield time and keeps us in the water. 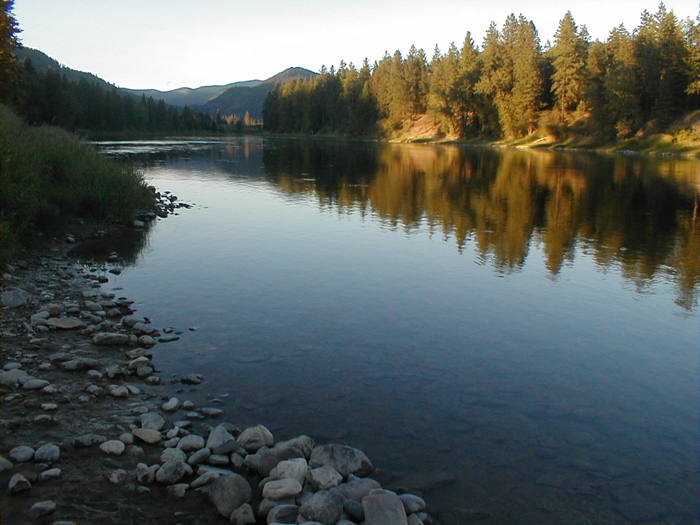 The Clark Fork is best characterized as big water, not easily wade fished without a boat. It has delicious flats to stalk rising fish throughout the different seasons. Riffles merge the flats with productive places to find fish …throw in the famous Clark Fork foam lines and eddies and you have the best big fish dry fly stream in Montana…without the crowds. The CF Fishing can be broken down into three season. Early, summer and fall. The early season runs March through April. This is the best time of the year to catch mister big on a dry fly. Spring fly-fishing can be some of the most productive for big fish. All have been semi-dormant during winter and are now hungry and eager to take a well-placed fly. The best times of day are between 10:00 a.m. and 4:00 p.m. on most days. On cloudy days that are cool, the prime time’s shorten and hatch activity may slow down. On bright, warm days the Skwalla stonefly will be the bug of choice. Along with the Skwalla we have the big Grey Drake (Western March Brown), and the Blue-Winged Olive in the Mayfly category. In addition to these we can anticipate the American Grannom Caddis will make its April appearance to round out our fishing menu. Scroll down to see a detailed hatch calendar for western Montana. The Clark Fork Outpost is located in beautiful Sanders County, Montana. I bet you are wondering about lodging and meals, or perhaps you prefer to learn more about the outfitter, Mike Hillygus.